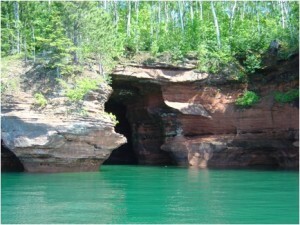 The wave sensor will let kayakers know ahead of time what wave conditions are lake at sea caves like this at the Apostle Islands National Lakeshore. As a long time sailor and paddler, I’ve learned, sometimes the hard way, that next to packing the right gear for a trip, there is nothing more important than a current weather forecast. Weather can make or break a day. In the worst case, it can put you in harm’s way. Having an up to date forecast allows for informed choices about when to go or stay on shore. On my boat that information came from the NOAA marine weather band. On trips into the bush I rely on a small, portable weather radio. But wave heights are typically not discussed at length or in detail. A project, reported in the Great Lakes Echo today, provides wave height information online for the Apostle Island National Lakeshore, a popular Wisconsin kayaking destination on Lake Superior. It looks invaluable. The project is called: Sea Caves Watch. It provide real-time information about wave height at the lakeshore, which is beneficial for paddlers who are travelling there and might want to explore the caves. It is designed especially for kayakers who are visiting them. The information is relayed by sunken buoys that measure the underwater oscillations there. The Great Lakes Echo story reports that the system was implemented in 2009 after a number of kayaking deaths occurred at the Bayfield Wisconsin park. The Sea Caves Watch program is a collaborative effort of the University of Wisconsin, National Oceanic and Atmospheric Administration and others. Read more: Remote wave sensor warns kayakers. This entry was posted in Uncategorized and tagged Apostle Islands National Lakeshore, Kayaking, Kayaking Safety, Lake Superior, Paddling, Waves, Weather. Bookmark the permalink.